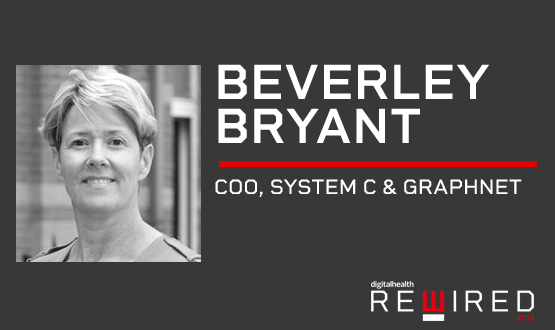 Our next Rewired speaker profile is Beverley Bryant who is the Chief Operating Officer (COO) of System C.
Beverley, who is also a former director of NHS England and NHS Digital, will be speaking at the Rewired Expo in March, providing her view of the key factors driving digital health development. We asked Beverley we she believes Rewired is the must-attend event of 2019. I am excited by Rewired’s new and refreshing take on the traditional ‘show and tell’ healthcare conference. Rewired has an interactive programme that is all about collaboration, sharing great ideas and best practice, and putting our heads together to overcome the challenges facing our industry. There will be something for everyone in the digital health tech space; whether you’re a code-loving techie taking part in the Hack Day, a senior executive attending the Leadership Summit, or a digital health practitioner that wants to hear about the latest innovations that are transforming care at the Expo. It’s also an excellent opportunity to network with peers and industry experts in person. Digital Health is a must-read news outlet for our industry and Rewired will follow suit and be the must-attend event for UK health tech.